It’s time for gourds and squash to fill up the produce markets! 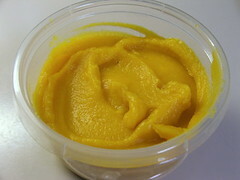 This year I decided to make my own pumpkin puree. I was inspired by a whole brigade of fellow bloggers who have been posting yummy looking recipes with their fresh pumpkin. Who am I to buck the trend? If they could, so could I! It is really easy, and the flavor is amazing. If you have never done it before, may I recommend it? You will thank me. Anyway, I had three pounds of puree from my pumpkins and I needed to do something with it. Two pounds I froze for the Holidays coming up, and I reserved one for experimenting on. I decided on muffins. Really, I don’t make enough muffins and it was time to rectify that situation! 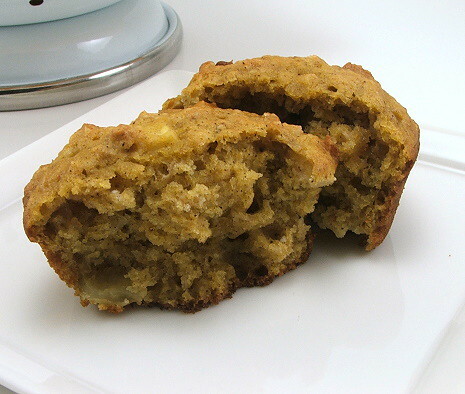 These muffins are hearty, flavorful, and make a great on-the-go breakfast or snack. They freeze well, so you can make them in a big batch and store them for the week. 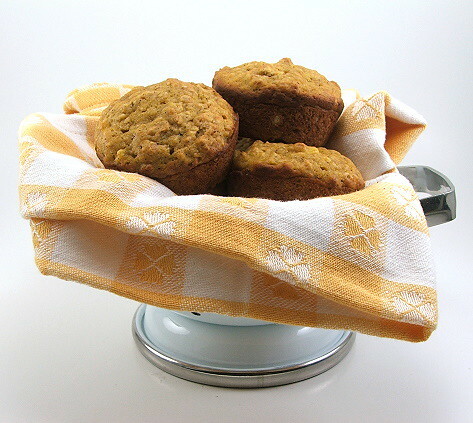 Wrap up warm muffins in a fall themed kitchen towel and give them as a seasonal kitchen gift. 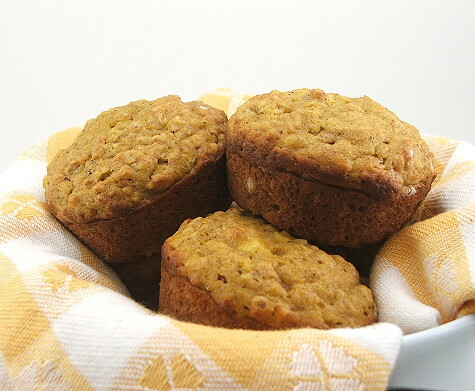 Serve the muffins with whipped honey butter for a brunch. They also make a really nice midnight snack … not that I would know or anything. 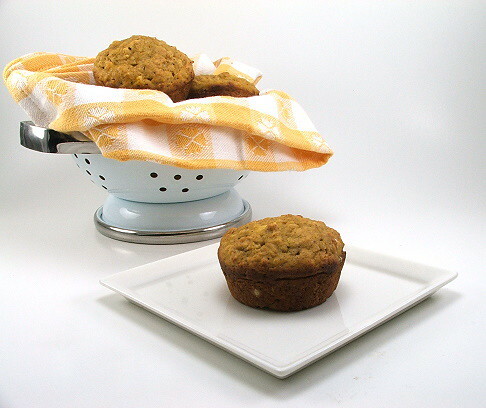 Heat the oven to 400F and spray a muffin pan with non-stick spray, or line with paper liners. 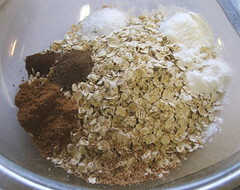 In a large bowl combine the flour, oats, baking powder, baking soda, spices, and salt. Mix well. 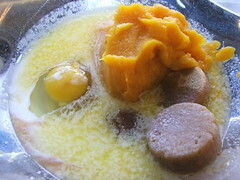 In a medium bowl combine the brown sugar, egg, vanilla, pumpkin, butter, and buttermilk. 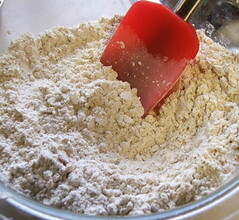 Pour the wet into the dry and fold gently until the dry ingredients are just moist. Add the apple and fold to combine. Do not over-mix. 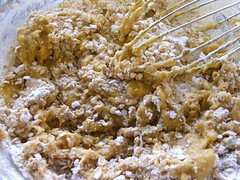 Divide the batter evenly into the prepared pan and bake for 25 to 30 minutes, or until they spring back when gently pressed in the center. Cool in the pan for five minutes then turn out on a wire rack to cool. 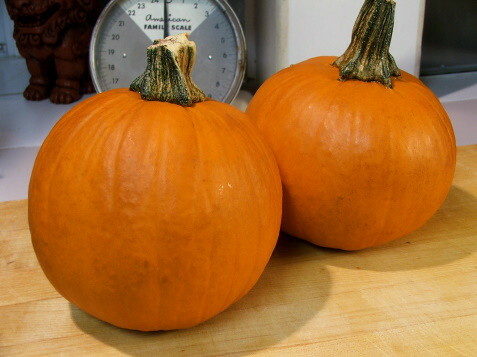 Start with a pie pumpkin, the small ones from the grocery store. Slice the tops off, then slice in half. 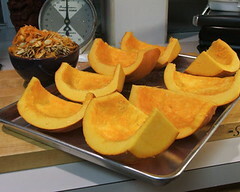 Remove the seeds and pulp (and reserve for making roasted pumpkin seeds), then cut each half in half. 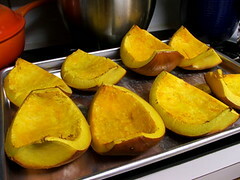 Place the pumpkin face up on a sheet pan and roast in a 350F oven for 45 minutes, or until the flesh is very tender. 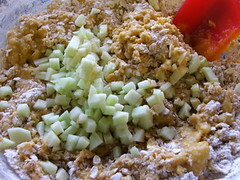 Allow to cool then remove the skins and place the flesh in a food processor. Process until smooth. The puree may seem dry. It it is you can add a little water, a tablespoon at a time, until it is thinner. 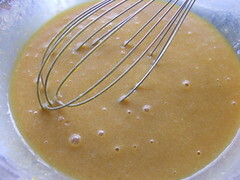 If the opposite happens and the puree is too wet just pour it into a fine strainer lined with cheese cloth or a coffee filter. Strain in the refrigerator overnight. Use, or freeze, within one week.